I am backporting OpenSSL 1.1.1a to Debian 8 and 9. It builds properly on an actual Debian 8 x86_64 and when I first brought this into OBS it built correctly in Debian 8 on x86_64, but threw an error during the post-build tests on i586. 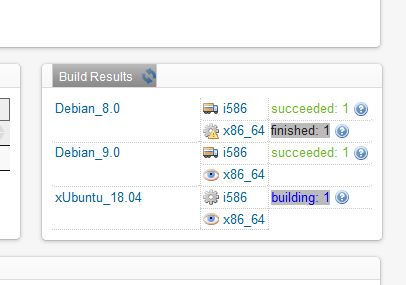 I wanted to see if this was an issue in Debian 8, so I added a Debian 9 repository. This is when it started getting funny. After I added the Debian 9 repository, the i586 target would show up, but x86_64 for Debian 9 didn't appear. This is on my subproject page. On the package page, the x86_64 architectures for each OS don't even show up. I have tried to trigger a build for x86_64 many times, it never occurs. No matter what I do I can't get x86_64 to build. The funny thing is, the original error I got building on i586 no longer shows up and it builds fine. I would think I had done something wrong in my backport, but it builds on the actual Debian Jessie x86_64 machine just fine, and it built here the first time I tried. It has been like this for almost a day. Am I doing something wrong? I saw that, but that's just back_home. There is back_stage, back_other, and back_main too. And a whole pile of x86_64 workers below that appear to be actively doing things. So I have no idea how to interpret that page. At least it's not a just me thing, though. Being new I wasn't sure if it was a PEBCAK.